What is #bpSewvember? It is an annual photo a day challenge for all the rad sewing people out there. It’s a chance to share a glimpse of your sewing world and meet like minded peeps. Sewing can often be a solitary pastime and for some of us it can be hard to find other sewists nearby. So let’s share our sewing spaces, our pattern stashes (eep!) and epic wins. It’ll be like having a gang of sewing buddies popping by everyday! Below are cheat sheets to the prompts for 2014, 2015, 2016 and 2017. Please feel free to share these on Instagram, your blog or any other social media that floats your boat. Throughout November each day’s prompt is posted on my Instagram account with a little blurb fleshing out each of the ideas. You can see past daily rounds up of each prompt under #bpPick. 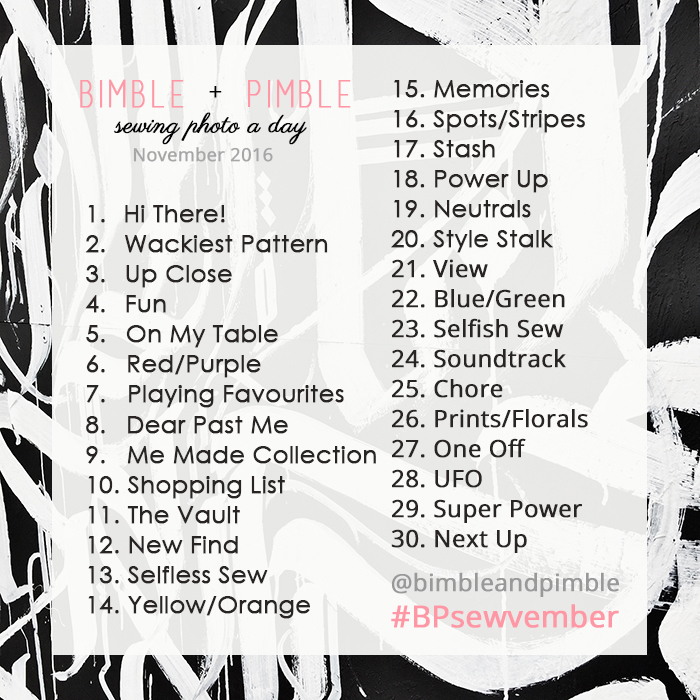 Post photos for as many or as few days as you want – there is no pressure to complete the entire set of prompts! bpSewvember is all about having fun and meeting people so engage in a way that works for you and makes it super fun! If you have any questions or want to find out more please hit me up via Instagram or email.